Years ago, my parents were making doll carriages and other kinds of doll accessories for doll collectors. They were buying dolls to showcase their merchandise. I was making cloth dolls at the time, but they asked if I could create an old fashioned teddy bear to show with their creations. Wilde & Woolly Bears was born. They won Best in Show, Best Dressed and Most Unique Bears at different shows. Some were featured in Teddy Bear Review Magazine, one in Texas Monthly Magazine, Texas Co-Op Magazine and the MacNeill Galley along with some newspapers. 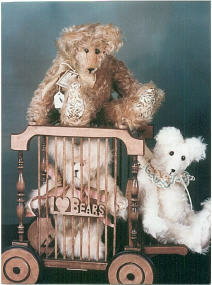 Some were included in the International Teddy Bear Connection film by Spectral Vision. They’ve found homes all over the world: Australia, Canada, France, Belgium, Russia, Kazakhstan, South Africa, and all over the U.S.! So I can’t like because I use blogspot… but I love stuffed animals, and she would go nicely with my others as she will have many news friends to be around. She needs to be loved and appreciated. She would be at home with all my other Bears and Animals..
Terry, this cutie would have the heart of my ‘sleepy time bear’ that my hubby bought me years ago from a craft fair out in Washington, that cost him way over a hundred bucks just to keep me company while he was at sea, the navy, I have been wanting a lovely little lady to keep him company now since he sits by his self on my bed each day. Please if she is to be gifted, please let her come and live with my little ‘Peppermint’ , this is what I named my bear since he carries a small white and red pillow and a sleep cap of the same color. Your babies are so beautiful! I’m not surprised that they have found homes around the world. There is just something about a teddy bear that makes them immediately lovable. Covering all my bases here…lol. I would love her and give her hugs and kisses every day. Love the red dragon red bear! Is he for sale? Super, I’ll mark him down as sold! 🙂 ❤ I'll add him to my list of bears to make and let you know when he's done. You can pay then! Thanks, Elizabeth! Awesome! He’ll look super next to my clan armstrong bear! Great bears !! How can I order one? Thanks, Lori! It soooo needed it. It’s looking so nice. Replaced the water heater, but looks like it’s the electric that’s the trouble. Still waiting on the electrician to call back. I love that faux mink bear. She’s just the cutest. I’ll add her to the list. Thanks, lady! These are the most BEAUTIFUL BEARS that I have seen in years. Ahh, thanks so much, Margaret! 🙂 ❤ You made my day! would like to buy the fairy bear on facebook-please tell me how. Hey, Susan, she’s $35 + $8.75 shipping. Did you want me to send you an email? Hi Terry! I’d like to order a Sherbert Bear for a friend’s Bday. Can you email me at Hildie@hildiemcqueen.com please? Thanks, Hildie! Sent you an email! thanks again, Very Proud Adopted Mother of "Blue Dragon of Light"
Hi, Toni, she sold. I’m in the middle of moving, so don’t know if I have more of that fur. I’ll check after I’m settled, but it will be probably the end of January before I can make any more bears. Thanks for loving her! Hey, Lisa! 🙂 I can make a purple/lilac bear! That’s so cute about the koalas! I would have to create a pattern for one, and with writing books, I just don’t have time. 🙂 Would you want the purple bear with suede paws or something embroidered on the paws? Name? I love them all. But my heart loves your Celtic bears. I want a Cougar and Jaguar too!! We’re can I see the Bears you are selling. I’m interested in the holloween bear with the most.